Do you have the SDK tools installed? i.e. at the path mentioned — /Users/dev/android-sdk-macosx/tools? If so, does the user that's running Jenkins have permission to access that directory and execute the commands in that directory? Did you really mean OS X 10.2.2, as I'm pretty sure the SDK (or parts of it) stopped working a long time ago on anything older than 10.6 (or so)? Christopher Orr added a comment - 2015-02-11 06:07 Do you have the SDK tools installed? i.e. at the path mentioned — /Users/dev/android-sdk-macosx/tools ? If so, does the user that's running Jenkins have permission to access that directory and execute the commands in that directory? Did you really mean OS X 10.2.2, as I'm pretty sure the SDK (or parts of it) stopped working a long time ago on anything older than 10.6 (or so)? Also, since you explicitly mention emulator-arm, does that mean that the other emulator binaries do work? If so, does emulator-arm work if you run it manually on the command line? 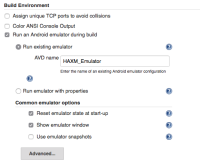 Christopher Orr added a comment - 2015-02-11 06:09 Also, since you explicitly mention emulator-arm , does that mean that the other emulator binaries do work? If so, does emulator-arm work if you run it manually on the command line? drwxr-xr-x 26 wesley staff 884 31 Dec 13:05 .
drwxrwxr-x@ 14 wesley staff 476 31 Dec 13:05 .. So it seems that Google quietly stopped bundling the 32-bit versions of the emulator for OS X as of SDK tools version 23.0.4. We required a 32-bit version of the emulator — when using snapshots — as a workaround for Android bug 34233, but that was fixed in SDK tools 22.6, so the plugin now no longer uses the 32-bit emulator executable. Christopher Orr added a comment - 2015-02-12 17:14 Thanks for the info. So it seems that Google quietly stopped bundling the 32-bit versions of the emulator for OS X as of SDK tools version 23.0.4. We required a 32-bit version of the emulator — when using snapshots — as a workaround for Android bug 34233, but that was fixed in SDK tools 22.6, so the plugin now no longer uses the 32-bit emulator executable. [FIXED JENKINS-26893] Disable the Android bug #34233 workaround on newer SDKs. of `emulator-arm` was no longer working. Now we only apply the workaround if an affected SDK tools version is installed. SCM/JIRA link daemon added a comment - 2015-02-12 17:15 Code changed in jenkins User: Christopher Orr Path: src/main/java/hudson/plugins/android_emulator/AndroidEmulator.java src/main/java/hudson/plugins/android_emulator/EmulatorConfig.java src/main/java/hudson/plugins/android_emulator/SdkInstaller.java src/main/java/hudson/plugins/android_emulator/sdk/AndroidSdk.java src/main/java/hudson/plugins/android_emulator/util/Utils.java src/test/java/hudson/plugins/android_emulator/sdk/AndroidSdkTest.java src/test/java/hudson/plugins/android_emulator/util/UtilsTest.java http://jenkins-ci.org/commit/android-emulator-plugin/b02c1cf8f0cc6b6fbc3686bcd0d3334a414a13c0 Log: [FIXED JENKINS-26893] Disable the Android bug #34233 workaround on newer SDKs. We no longer need to avoid the 64-bit emulators as of SDK tools version 22.6, and the 32-bit emulators are no longer bundled on OS X, so hardcoding the usage of `emulator-arm` was no longer working. Now we only apply the workaround if an affected SDK tools version is installed. Thanks thats great. Do you know which version it will be fixed in and when will it be released? Wesley Archbell added a comment - 2015-02-12 23:25 Thanks thats great. Do you know which version it will be fixed in and when will it be released? It will be fixed in the next release, which I'm hoping to do within a week — I have some larger changes that need to be tested first. I know this is a separate issue but when will we be able to run this plugin against HAXM emulator? Wesley Archbell added a comment - 2015-02-13 01:39 I know this is a separate issue but when will we be able to run this plugin against HAXM emulator? That has always been possible (well, since shortly after HAXM appeared). Are you having problems starting an x86 emulator? Christopher Orr added a comment - 2015-02-13 02:02 That has always been possible (well, since shortly after HAXM appeared). Are you having problems starting an x86 emulator? I can see it start the emulator on mac mini but even once its started, the logs still indicate the device is offline even though emulator has started..
That's JENKINS-11952, for which I'm going to publish a fix today and try and get people to test it out. Christopher Orr added a comment - 2015-02-13 12:48 That's JENKINS-11952 , for which I'm going to publish a fix today and try and get people to test it out. Version 2.13 of the plugin has been released, which includes this fix. Christopher Orr added a comment - 2015-03-12 09:12 Version 2.13 of the plugin has been released, which includes this fix.